As the marine renewable energy (MRE) industry advances and devices are deployed, there is a need to understand potential environmental effect of introducing structures to marine waters and potentially attracting marine organisms. These structures may act as artificial reefs, underwater human-made structures that function similar to a natural reef, and can include oil and gas platforms, sunken ships, concrete reef balls, and MRE devices. While artificial reefs are used to enhance the marine environment and benefit organisms, such as by attracting reef-associated fish, research is still needed to fully understand the positive or negative impacts MRE devices when acting as artificial reefs. Studies in the US have been carried out by Dr. Sharon Kramer while Dr. Olivia Langhamer has studied these potential effects in Europe. Fish, sea stars, and an anemone around an artificial reef. The immense pressure on coastlines and severe threats to marine biodiversity can both be linked to anthropogenic activities that cause climate change, alter the marine environment, and harm marine organisms. In order to prevent and mitigate these negative effects, artificial reefs have been deployed worldwide as one measure to restore marine habitats; prevent loss of biodiversity and biomass; increase habitat-complexity; and increase local productivity. MRE and offshore wind installations can act as de facto artificial reefs; Dr. Langhamer has worked on two projects observing the reef effect on mobile marine species. A wave power foundation, which has been studied by Dr. Langhamer for reef effects, being deployed at the Lysekil wave power research site. Dr. Langhamer’s PhD. studies focused on observing local reef-associated species around wave energy foundations in the Lysekil wave power research site in Sweden, in cooperation with a research dive team. 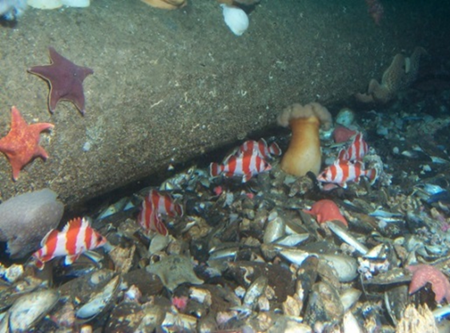 Over three years, visual underwater observations around 26 wave energy foundations showed that mobile organisms, such as fish and crabs, occurred in higher densities near the foundations than in surrounding soft bottoms. To compare the effect of complexity, half of the concrete foundations were constructed with holes for shelter. The foundations with holes produced a positive effect on the quantities of edible crab, but resulted in a smaller density of spiny sea stars, possibly effected by the increase in predators such as edible crabs. The research team concluded that that low-cost enhancement of wave power foundations using holes may result in a species-specific response. Additionally, this study showed that the reef effect increased the local density of edible crabs five-fold when specially designed wave power foundations were built in low complexity areas (homogenous soft-bottoms) and provided the crab an increased availability of shelter. 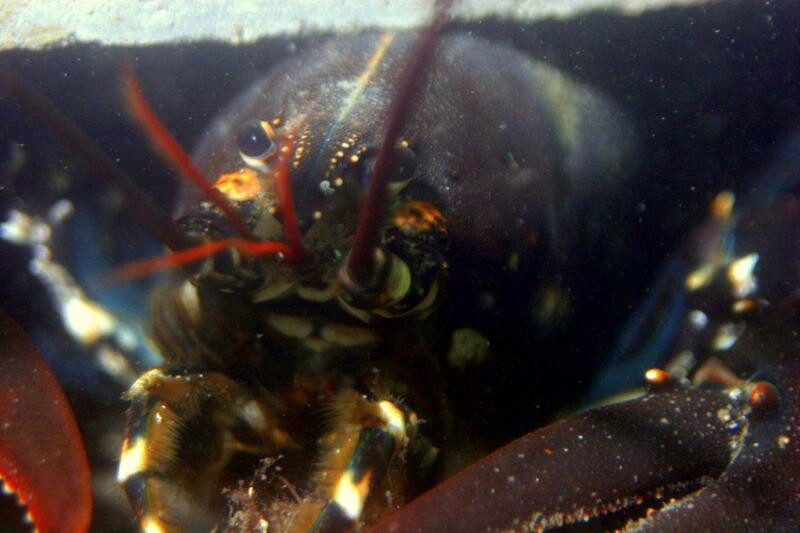 Close up of a European lobster (Homarus gammarus) beneath a wave power foundation in the Lysekil wave power research site. Dr. Langhamer also studied population dynamics of common shore crabs and viviparous eelpouts in the Lillgrund offshore wind farm in southern Sweden where gravity-based foundations were deployed and 15% of the Lillgrund area was covered by artificial hard substrate, mostly rock-filled scour protection. Thousands of crabs and hundreds of eelpouts were captured, marked, released, and then recaptured. The morphology and fitness of both species was studied to assess the state of populations in the wind farm, however relatively low recapture rate of both species led to sparse data and high variations in estimates. Neither species was observed to aggregate in, nor avoid, the offshore wind farm nor could any clear reef effect be seen. These results suggest that the operating wind farm did not have negative effects on populations of shore crabs and eelpouts as no negative behavioral or lower fitness effects were observed. Overall conclusions may be drawn that reef effects can be observed around some MRE and offshore wind installations, depending on the specific location, design of the deployed hard substrate such as foundations, surrounding bottom substrate, and differing species. The reef effect may be greater for wave energy devices that are deployed on featureless soft-bottoms that create new habitats for specifics to occupy. In addition to the siting of new wave energy parks, low-cost enhancements for higher complexity can counteract negative environmental effects on local species abundance and biodiversity. Thus, if MRE or offshore wind installations are planned carefully and managed in a sustainable way, these activities may aid in the restoration of damaged marine ecosystems while providing clean, renewable energy. Will Marine Renewable Energy Devices Act as Artificial Reefs or Fish Aggregating Devices? 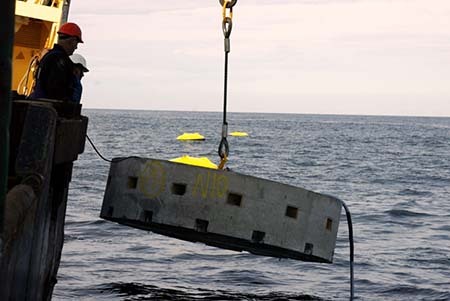 Wave energy conversion projects introduce structure to marine waters, with anchors on the ocean floor, mooring lines in midwater, and devices at and near the surface. There is concern that such structures will attract organisms, including threatened and endangered fish, and expose them to greater risks of predation and entanglement or collision with the device. Especially in the Pacific, where there are few established projects from which to learn, environmental regulators, developers, and scientists need a greater understanding of the ecological effects of WEC devices to inform intelligent siting and support more rapid permitting of promising projects that are sensitively designed and located. Components of WEC projects may act as artificial reefs or fish aggregating devices (FADs), therefore, it is important to understand the differences between artificial reefs and FADs. One difference is simply the position of the structure within the water column (ocean bottom versus midwater/surface). A second difference is the type of response by fish: artificial reefs function primarily as habitat for demersal, reef-associated fishes or their prey, whereas FADs, like other surface or midwater structures, function primarily as a means of orientation for fishes in open water, probably based on the optical reflex that leads a fish to orient to a solid object in moving water. Artificial reefs may simply concentrate existing individuals, or may serve to enhance the regional production of fishes; the latter is more likely if hard-bottom habitat is limiting in the area. 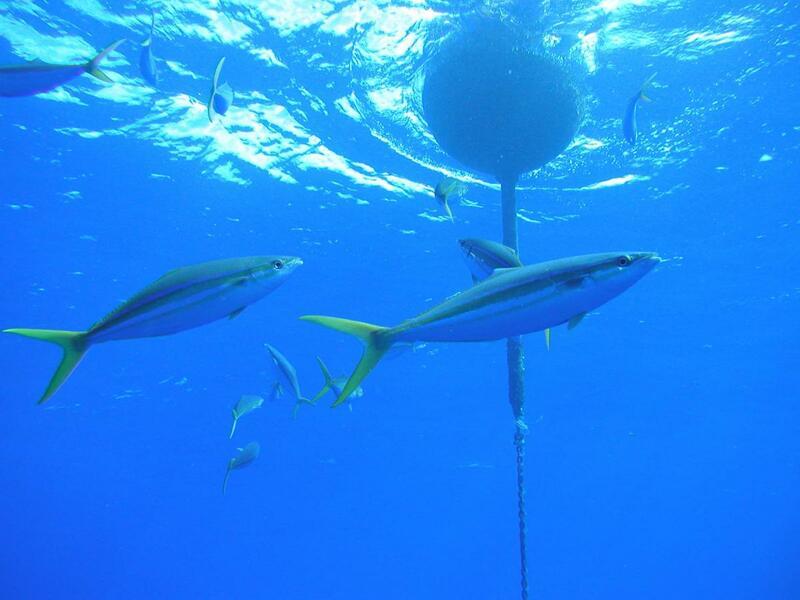 FADs may also enhance regional production of fishes by aiding in juvenile dispersal, or by improving the survival rate of juveniles via protection from predators and/or by congregating food sources. Understanding of these ecological interactions is important to inform permitting and licensing of WEC projects. To begin to address this significant data gap, Dr. Sharon Kramer of H.T. Harvey & Associates systematically reviewed published studies of fish associations with structures that can be considered surrogates for WEC device structures. These surrogates include artificial reefs, natural reefs, kelp forests, flotsams, oil and gas platforms, marine debris, anchored fish aggregating devices deployed to enhance fishing, and mariculture net-cages. In addition, Dr. Kramer and her team hosted guided discussions with subject matter experts to glean additional insights about the fish species assemblages observed at these structures and potential interactions of concern. Four regions, three off the US West Coast and one in Hawaii, were covered in the review that examined physical, biological, and structural variables in each study and queried whether the surrogate structures attract fish, and if so, which species. Of the species identified, special-status fish (such as those that are endangered or threatened) were of key interest, as were any negative effects indicated. Lastly, Dr. Kramer examined which variables were most important in predicting fish attraction, and with what level of certainty. The results suggest that the seabed structure (e.g. anchors) of WEC projects in US West Coast and Hawaiian coastal waters will function as small-scale artificial reefs and may attract high densities of reef-associated fishes. Further, midwater/surface structures (e.g., WEC devices, moorings) in Hawaiian tropical waters will function as FADs. In US West Coast waters, juvenile, semi-pelagic, kelp-associated rockfishes may occur at midwater/surface structures. Seasonal or transitory associations of coastal pelagic fishes are likely in southern California waters, but may be less likely further north. Additionally, negative effects of WEC structures on special-status fishes, such as increased predation of juvenile salmonids or rockfishes, are unlikely. In fact, WEC projects in US West Coast waters, especially off southern California, could greatly enhance rockfish productivity if fish respond to the structures as they do to oil and gas platforms. Funding for Dr. Kramer’s work was provided by the U.S. Department of Energy and Bureau of Ocean Energy Management. Science advisors included Dr. Pete Nelson and David Itano.